Throughout the United States, and in the United Kingdom, ear infections are markedly more common in December through March. Their incidence is particularly low from July to September. Shockingly, careful studies (e.g. Pediatrics December 1992; 90:1006) have found that 0% of children with ear pulling as the primary sign had ear infections. Even in conjunction with other important clues, such as fever, only 15% of those brought in for ear pulling actually had ear infections. Most commonly, children pull their ears from itching (caused by soap or shampoo in the canal, or by a healing infection), teething, exploration, comfort, or habit. Most ear infections hurt. The pain builds as the pressure in the ear builds, from a dull ache to a sharp stabbing pain. The pressure is relieved intermittently, so the pain comes in waves. The pain is worse at night. Most ear infections occur in children under age two. The best clue is evidence of pain, such as crying or screaming (usually less than half an hour), fussiness or irritability (worse when lying down), or suddenly increased difficulty sleeping, especially at night. They often have no pain the following morning. In an ear infection, fluid fills the middle ear. Older children often mention a feeling of fullness or decreased hearing in the affected ear. This is difficult to detect in an infant, but you might notice shaking of the head. Only one third to one half of children with an ear infection will develop a fever. Temperatures over 104 occur in fewer than 5% of ear infections. 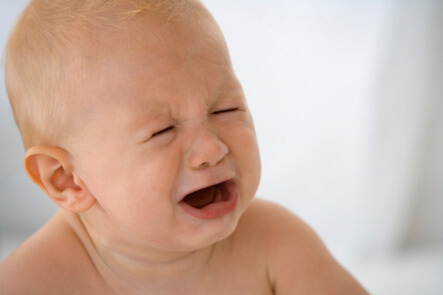 Fevers are more common in infants and toddlers than in older children. By itself, a fever is not a powerful clue; but in conjunction with the clues outlined above, it is quite incriminating indeed (the combination of fever and pain is most often an ear infection in infants and toddlers). Don’t let other symptoms, such as loose stools or vomiting, throw you off the trail. Ear infections are sometimes accompanied by systemic symptoms. Something must plug the Eustachian tube for an ear infection to occur. An upper respiratory infection is often the culprit. The accomplice might also be a change in elevation, allergies, an irritant (such as cigarette smoke), reflux, or drinking a bottle while lying on the back. Even with the above clues, only objective evidence can clinch the diagnosis. There is now a wonderful device that uses sonar-like technology to detect fluid in the ear. The device, called an EarChek, is inexpensive, accurate, and simple to use at home. If there is no fluid, there is no ear infection. If fluid is present, only direct visualization of the eardrum by a skilled observer can determine if this is an acute ear infection. Remember, it is possible to have an ear infection in an infant with no clues. Here, a positive reading on the EarChek may be the first sign. Also, regular well-child pediatric visits in the first two years screen for these silent episodes. my kid 4yrs, gets cold almost every week. then he gets earpain in the night. what do i do to prevent earpain following cold attack. I’m so sorry you and your son are going through this. Several things make getting colds more likely. One of the biggest is exposure to secondhand smoke. Another cause of repeated colds is daycare. If your child is in a daycare setting with more than six children, the rate of infection goes way up. When your child does have a cold, he is more likely to have ear pain at night when he’s laying flat. This is because it’s harder for the ear tubes to drain in that position. You can raise the head of his bed by putting risers under the legs at the head of the bed, but not at the foot. If he still has ear pain, there are ways to treat the pain. See Dr. Greene’s post about treating ear pain. My oldest child had 3 sets of tubes. That was after 15 ear ifonctiens in one year. I am happy we finally made the decision to have them put in. She eventually grew out of them and didn’t need them anymore (around 5). Her eustation tube just needed to grow some more so that the fluid could drain on its own. It is hard to see them go into surgery but it is really not a big one and is really quite quick and painless for them. Good luck!